Capturing moments through photographs is definitely one of the precious things you can do to preserve great memories. It’s nice to look back on old photographs and they definitely make everyone take a trip down memory lane. It’s a nice way to show to friends and family whenever there is a gathering. This is why creating photo books are a fun way to preserve all those old photographs. Every time you open it, you get to relive each moment and milestones in every page. Here are four tips for creating a unique photo book of your memories. The key to creating a great photo book is to organize all of your photos beforehand. It will be a lot easier to design and gather all your photos if you have already organized it. If you have not printed your photos yet, make sure to keep your photos in its designated folder as it will help you save a lot of time later on when you are already printing it. If you have already printed the photos, make sure to organize it in order of how you want it to be placed on the photo book to save you time and effort. Choosing a theme for your photo book gives it a kind of storyline. For instance, if you went on a road trip, your photos will look great on a photo book with an Old Western Typeface. Getting the feel of your photos will allow you to think of a good theme for it. Try to research different themes and try to get the feel for which one best fit for your photos. With a great theme for a photo book, you will be able to transform your collection of photos into an interesting one. What makes a photo book interesting is if it tells a story. You don’t want a collection of photos that remains that way and doesn’t have some sort of story behind it. If you are unsure of how to do it, you can simply create a photo book and have all the photos arranged in chronological order. For example, if you have photos of your child, arrange it in a way that starts with his or her first year, the first day of school, graduation, etc. It will be a lot easier to present the story if recreate the sequence of how all those events have occurred. 4. Don’t put too many photos on one page. Always remember when you are creating a unique photo book; give the photos a space to breathe. Having too many photographs on one page can be a little overwhelming so try to give every photo some space. Otherwise, you are going to struggle with seeing a lot of images. Always remember that less is more. 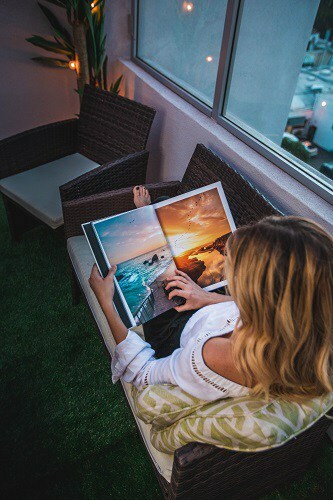 Make sure to curate your photo book beautifully and only put a few in each page so you’ll give it a chance to shine on each page.